Everyone seems to think the Black Series figure will be an imperial, but after running with Iden Versio and the Jumptrooper, it's also possible Gamestop could choose the title Jedi character (named Cal, I think). That would require an all new sculpt, which is very unlikely. Going by previous games we'll be lucky to get Cal. Does the Cantina interest you? Visit the Cantina Crazies Center! - B/S/T Feedback! While it might look like a cool toy, I'm with TK114 on this. None of this stuff looks like Star Wars. Also, I've always felt that putting more forcey stuff and lightsaber wielders into Imperial period Star Wars went against the actual films. In the OT, Vader is laughed at for being a relic of a fanciful past. He's a symbol of a hoaky religion, that nobody takes seriously. Adding in more and more lightsaber toting folk just jars with me and it always seems at odds with the films. This honestly isn't anything new. The Inquisition was started in the 90s through the old EU. Along side the Emperors Hand. Both factions are secretive. Only known to a few select high ranking Imperials. Personally I love MOST of their looks. The ones seen in Rebels along side this new one from the game. I'm not a fan of the additional ones introduced in the Marvel comics though. They look out of place eith the rest. Who I think look VERY Star Wars personally. At the SWCC panel, they were specifically called "Purge Troopers". In that case I guess we can chalk it up to late PT era Purge Troopers vs late OT era. Does anyone know if EB Games in Canada is offering the same bundle? I don’t see any mention of it on their website. The old-EU Sith (and other evil Force users) were mostly Darth Maul ripoffs. At least these ones all have a clear Vader-like motif to them. Black Series 6" Wish List: Aemon Gremm, Moff Jerjerrod, Death Star Gunner, Ponda Baba, Dr. Evazan. Nobody expects the Imperial inquisition. 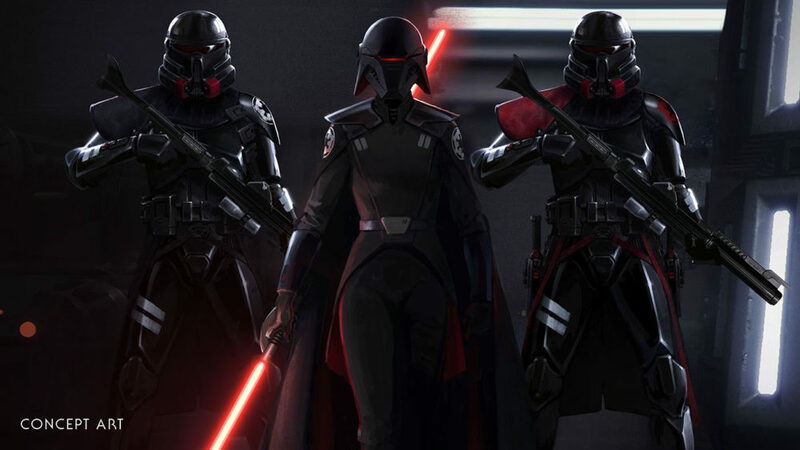 I don’t see why it couldn’t be the Purge Trooper but I’d love for it to just be Second Sister. I have no interest in an Ian Gallagher Jedi figure. The prequels changed the intended timeline and characterization of the Jedi Order. Just think Motti already hated Jedi and force users during the Clone Wars and embraced Imperial propoganda. It can still work honestly. Motti’s opinion was a reflection of anti Jedi sentiment and was speaking rudely to Vader because he thought he could get away with it and he was just insulting for political reasons. I've never seen/heard of these until today - is this what they look like? If so, I'd be down for one maybe? If it were the character in the center, then I'd seriously consider getting the GS Exclusive. Or just about any new figure might compel me, but simple repaint? no thanks. People are going to be repainting Purge Troopers into Airborne Clones. I'd hate painting white over black but maybe they'll be patient for the inevitable official one. I kind of forget only one Airborne color appeared in ROTS and the rest were Hasbro invented or from BFII.